Joanna and her Amazing Technicolor Interwebs: Choose Our Adventure (Again)! Last trip Kyle and I let my blog readers pick which Magic Kingdom attraction we would ride as soon as we got to Walt Disney World. 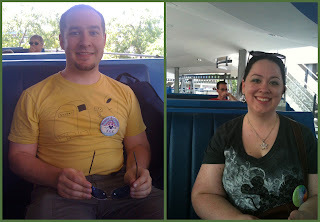 We greatly enjoyed putting our "fate" in your hands, and the Tomorrowland Transit Authority Peoplemover won (which we both loved)! from the TTA: Peoplemover to prove we rode it first! In celebration of the fact that in one week we'll be at Walt Disney World, we've decided to allow you, the readers, to choose our adventure again! All of these attractions are "dark rides" meaning that videos of them aren't super easy to see, and (PSA moment here) FLASH PHOTOGRAPHY is NOT ALLOWED. Some of the attractions have sections in sunlight or brighter light that are easier to see. 1. Spaceship Earth: SSE is one of the most beautiful pieces of architecture in the world (in my eyes at least). The ride inside is historical and iconic. Anyone who loves Epcot will tell you that there are times when they miss the smell of Rome burning. This is the only non-holyRONANempire video because this one has better audio. The YouTuber for this video is disneyrob. Spaceship Earth is currently narrated by Dame Judi Dench. 2. Living with the Land: I don't know if it's the catchy song, the absurdity of 10 pound lemons, the short wait time, the peacefulness of this boat ride, or just the neat information inside this attraction, but this is one of my favorite attractions at Epcot. It's calm and fascinating and a nice rest stop. 3. The Seas with Nemo: This attraction is best experienced with Katelyn and Joshua at my side, but I always like to visit it at least once during a trip to ride the EAC with Crush! This video walks you through the queue too. The ride itself is towards the final third of the video. 4. The Three Caballeros: I could go on this attraction over and over and over again! I love singing along with the music (and that Kyle sits next to me and sings along as well), and the wait time is always short. I think it's one of Epcot's hidden gems. I can't count how many times we rode it in June! 5. Maelstrom: The queue for this ride makes me claustrophobic, and the attraction itself is really kinda of weird, but I always enjoy it. The trolls are fun, yet spooky, and the exit from the boat is different than most exits (looks like you're walking onto the dock in a town in Norway). Around the 3:00 mark the ride goes into a lighter section that's easier to see. It's like the Internet: you have to look out for TROLLS! Here's the fun part! You get to vote using the poll on the RIGHT side of my blog (under my Castle icons - way back up there at the top of the page)! Just click on the circle next to your favorite attraction. We would love for you to leave a comment below to let Kyle and me know why you like the attraction you chose. The poll ends at noon on the 10th. We'll check the results on our phones on the way to Epcot and then tweet pics of us on the attraction of your choosing. Spaceship Earth! You HAVE to thank the Phoenicians! :-O I can't believe you told everyone that I sing along! That was supposed to be a secret! Now I'm just going to have to purposefully order all my meals so that I have fruit on my entrees as payback. Oh my, I missed the Three Caballeros on my last trip! I MUST see that on my next visit!!!!! Spaceship Earth. The classic EPCOT Center ride, and it offers a good overview of what the entire park is about. Only one ride can win the election, but thanks to DragynAlly's Phoenicians comments, we are all winners. Kyle - Hahaha! You'll have to try harder than that. Fruit on entrees doesn't offend me unless someone tries to force me to eat. Guess you could order it & constantly offer me a bite. LOL! txmommy34 - I always hope to get stuck on that ride to hear Crush say that! I'd agree that would get the song stuck in my head very easily. EE - I figured this poll would be right up your alley! SSE is the one I hope wins. Beth - Good point. I should have clarified that. Once we get off the plane, off the DME, and checked in at the resort, WS will definitely be open. :) I agree about SSE! Seems weird to pass it when you walk into Epcot! If Maelstrom wins do you have to ride both the ride and watch the movie, or just the ride? I'm calling Poll Foul on the movie. No way. I say it is part of the attraction as it has no seperate entrance, so you would be bound by blogspot election law to watch the movie should it win. Shut the front door. Riding Norway does not constitute watching that movie! In fact, once could argue that it's tradition to walk through the front of the theater to get to the exit from the ride and watching the movie would be out of the norm. What do you know, the terror of the seas! Wait in our line, feel some claus-tro-phoby! so that's why we sing this nifty song. A Viking ride for thee! 1. SSE is only 2 votes behind. 2. How is it possible for you to have this much pull online when you aren't on Twitter or the Book of Faces?! 3. What exactly is the tune of that song? I agree it's anybody's race. I just wanted my choice to have a song. Wait, you can vote online? I've been licking all the stamps for nothing!